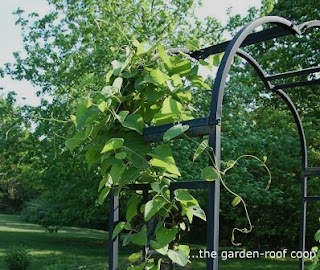 the garden-roof coop: Pipevine--an interesting native vine and a gracious host..
Pipevine--an interesting native vine and a gracious host.. I "accidentally" created my butterfly garden eight years ago by planting herbs next to my annual and perennial flowers. I had no idea that I was providing the perfect environment-the food and nectar-for some of the swallowtail species. 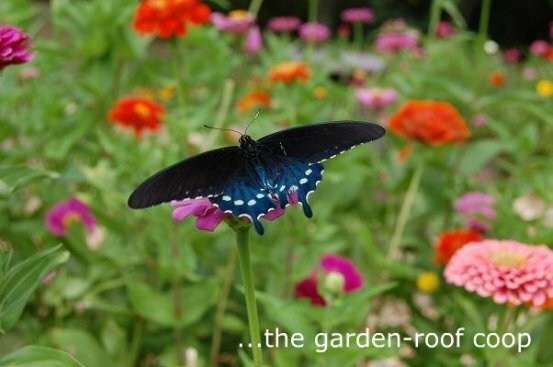 Since then, my excitement or obsession with butterfly gardening has grown and I've tried to include in my garden as many of the host plants for the caterpillars/larvae of our native Missouri butterflies that I can. Three years ago at a native plant sale I bought two Pipevine plants (Aristolochia tomentosa), this is the food source or host plant of the Pipevine Swallowtail larva. I have an arbor at the entrance of my butterfly garden and I thought this would be the perfect and permanent location for this perennial vine. One thing I have learned about this vine is to be patient..It grew very slowly the first year and I was concerned it might not return the next. There is an old saying about perennials: The first year they sleep, the next they creep and the third year they leap! This couldn't be more true about the Pipevine--it takes it's time. This summer was it's third year and the first time that it bloomed. The flowers were small, insignificant, but interesting and they did resemble or were shaped like a "pipe." --I think the butterflies were waiting for a flower to help them identify the plant, because for three years I didn't even have a second glance from the swallowtails and this year--I had probably 100 larvae! A monarch will lay one egg on one milkweed leaf--a Pipevine Swallowtail will lay a lot of eggs on one leaf... When the caterpillars emerged from the eggs, it was a sight to see--and they had a huge appetite. In fact, if you stood close to the vine, you could literally hear the crunching! I started thinking that perhaps this was a little much for my immature vine. Would it survive having every leaf munched away? I decided to donate 12 of the caterpillars to the local butterfly house,-- Dr. Bill Roston Native Butterfly House at the Botanical Center in Springfield, MO. I was advised to thin out the larvae to keep from defoliating the vine and spare the plant. I know this is pathetic, but I couldn't get myself to do this.. I figured, this is a native plant, this isn't anything new--if the vine couldn't tolerate being eaten on, it wouldn't be the host plant. 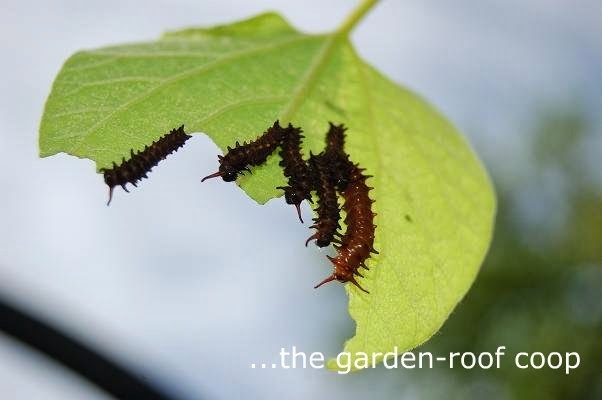 Thankfully, my hunch was right and the vine re-budded, the leaves returned, and another batch of caterpillars appeared! 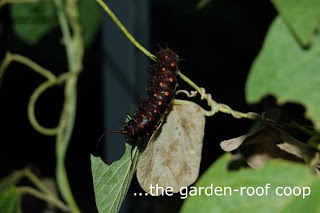 For the average person, an insect eaten, leafless vine is probably not an attractive addition to the garden, but true avid butterfly-gardeners are of a different mindset and I was thrilled-proud-of my giving, rejuvenating, sustaining vine! Even though not everyone would enjoy the viewing of-or listening to-an army of hungry worms, few would deny the beauty of the end product....The Pipevine Swallowtail! To find more great plants, check out the link... "How to Find Great Plants" at Appalachian Feet.. It's so nice to meet another 'cat' lover, Rebecca! This past summer was my first being able to observe swallowtail cats in my garden. It was thrilling to watch them eat the parsley and then pupate. I had so many swallowtails flying around my garden I couldn't count them all! Thanks so much for visiting my blog today. Welcome to blogging...I noticed you are listed on Anna's website. That's terrific! Great post! I also grow pipevine, but I haven't noticed it blooming. It does tend to be very aggressive, growing underground runners that come up everywhere! I keep it just for the swallowtail cats too, hundreds of them! Planted this one year and when it didn't wake up by the end of May, I pulled it out thinking it had died. I discovered later in the day that they are very slow to break dormancy and felt like an idiot. I planted another one last fall. I'm hoping it makes it through the winter and grows this summer. It probably will as long as I leave it alone. Oops!